Part 1, chapter 1 of the Protection of Freedoms Act implements the commitment in the Government's coalition agreement to reform DNA and fingerprint retention. This Government want to protect the privacy and human rights of its citizens, while maintaining effective databases that protect the public and reduce crime. The Protection of Freedoms Act fundamentally changes the principles behind the operation of biometric databases. From being databases that collected DNA profiles and fingerprints from every person arrested and retained them indefinitely, they will now operate proportionately, considering guilt and innocence, the seriousness of the offence and the age of the individual. In this way, they can continue to operate effectively while providing far greater protection of civil liberties. Implementation of the Act is not a simple matter. A large amount of work is needed to prepare police forces, forensic laboratories and national databases. Complex reprogramming of databases is required to ensure that each person's DNA and fingerprints are removed or retained correctly and at the right time. This work will be carried out thoroughly so that biometric material is not held unlawfully, and material needed to solve crime is not unnecessarily deleted. Before the Act commences, it is necessary to destroy a significant amount of existing biometric material that the Act would not allow to be retained. The first priority is the destruction of DNA samples. A DNA sample is an individual's biological material, containing all of their genetic information. The Government do not want to retain the complete genetic makeup of any of their citizens. Every DNA sample taken will be destroyed as soon as a DNA profile for use on the database has been obtained from it. Destruction of existing DNA samples will begin in December 2012 and be completed by May 2013. DNA profiles, consisting of a string of 20 numbers and two letters to indicate gender, are stored on the National DNA Database (NDNAD). They allow a person to be identified if they leave their DNA at a crime scene but contain none of the person's genetic characteristics. The NDNAD and the Police National Computer (PNC) must both be reprogrammed to allow DNA profiles which may not be retained under the Act to be correctly identified and deleted. Deletion from the NDNAD of existing DNA profiles which do not meet requirements for retention will begin in January 2013 and be completed by September 2013. Fingerprints are stored electronically on the national fingerprint database, IDENT1. IDENT1 and the PNC must both be reprogrammed to allow fingerprints which may not be retained under the Act to be correctly identified and deleted. Deletion from IDENT1 of fingerprints which do not meet requirements for retention will begin in March 2013 and be completed by September 2013. Following deletion of each IDENT1 fingerprint set, police forces will destroy any corresponding hard copies they hold. The Biometrics Commissioner will be appointed in early 2013. The role of the commissioner will be to keep under review the retention and use of biometric material retained subject to the Act's provisions, and, in particular, to adjudicate on those cases where the police apply to retain material of someone arrested for, but not charged with a serious offence for a limited period or where a national security determination is made. Once destruction of existing biometric material is complete and the necessary processes have been set up, legislative commencement will take place, no later than October 2013. Developing the technology for a fully automated speculative search will take a few more months. A transitional measure will be provided to allow speculative searching and quality checks to be undertaken using existing technology. This will ensure Commencement is not delayed and matches to crimes are not missed while the final piece of work is completed. In line with the Supreme Court decision of 18th May 2011 in the cases of C and GC v The Commissioner, and based on legal advice, the MPS will continue to process exceptional case requests in accordance with the ACPO policy of 16th March 2006. We will do so until Parliament introduces a new legislative scheme. So until then, if you believe your situation is exceptional, you may still want to request the chief constable of the force that arrested you to (re)consider your case (for practical tips, see Reclaim Your DNA.) If you succeed to have your case considered exceptional, your Police National Computer (PNC) record will be deleted as well as your DNA and fingerprints, there is no such promise in the Protection of Freedom Act's implementation timetable. As for photographs kept by the police, limit on their retention will likely have to wait for a test case to come to court. As the timetable does not specify a notification mechanism, for those innocents having been arrested, any celebration for not having personal data held by the police anymore and no longer being an honorary criminal will have to wait until next autumn. 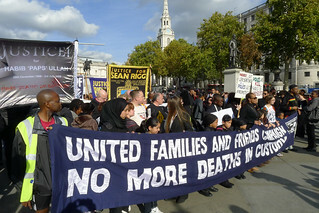 The United Families and Friends Campaign (UFFC) – a coalition of families and friends of those who have died in the custody of police and prison officers and in the care of secure psychiatric hospitals – will have its 14th annual remembrance march against custody deaths this Saturday 2012-10-27. There will be a silent procession along Whitehall, followed by a noisy protest at Downing Street. Assembly is at 12.30pm by the South side of Nelson's Column in Trafalgar Square. Replacement of the Independent Police Complaints Commission (IPCC) to ensure open robust transparent and thorough investigations from the very outset of police deaths in custody – with a removal of all ex-police officers for it to be a truly independent body. The Prisons and Probation Ombudsman should be placed on a statutory footing. Deaths in psychiatric detention and/or of those detained under the Mental Health Act must be subject to a system of properly funded investigation that is completely independent of the Health Service. Officers and officials directly involved in custody deaths are suspended until investigations are completed. Officers and officials should never be allowed to collude over their evidence and statements of fact. Full and prompt disclosure of information to the families affected. There should be an automatic right to non means tested legal aid for families. There is a lack of funds for family legal representation at Inquests whilst officers and NHS staff get full legal representation from the public purse – this is unbalanced. In answering your specific question I can advise you that Marylebone Custody Suite was not opened in order to target any specific public order operation. However on the day in question there were a number of events taking place in central London including The United Family and Friends Campaign annual march, Amnesty International solidarity to Syrian protestors march and Syrians love Syria counter demonstration. In order to ensure sufficient facilities were available on this day, a charge centre in close proximity to the marches was requested. In this instance Marylebone Custody suite was selected as the dedicated charge centre. There was no specific request for the charge centre to be Marylebone. It was selected due to its proximity to the events taking place. The officer with the responsibility for this task was a sergeant from Kensington and Chelsea borough police working under the direction of Commander Michael Johnson from Public Order and Operational Support (CO11). Several of those present wondered if Marylebone and other overflow custody suites are visited by Independent Custody Visitors (ICV). To find out I made several freedom of information requests and compiled the table in the post Visiting London's police custody suites. As custody suites can't be opened at short notice, the police can inform independent custody visitor panels of the opening of (non 24/7) custody suites at least a couple of days in advance and custody visitors can decide whether to schedule a visit. This system works for many overflow custody suites, however the Marylebone custody suites is one of those that didn't receive any ICV visit during 29 consecutive months. See the mentioned post for full details of independent visits to all of London's custody suites. The guidance for the transportation of detainees is covered in the Police Driver and Vehicle Standard Operating Procedures (SOP). Specifically relating to the transportation of detainees in vans, officers are advised to accompany detainees so that they can be viewed at all times to prevent the detainees from self harm, taking illegal substances or disposing of evidence. The decision on whether a detainee is handcuffed to the front or to the rear is at the discretion of the officer. However, the SOP does give some guidance, that persons handcuffed to the front should be monitored to prevent the issues raised above from occurring. Regarding the fitting of seat belts in the secure area of vans, currently there are no seat belts fitted as they could become ligature points or could be used by a detainee to cause injury to police officers or staff. The SOP was last reviewed in 2010 and as a living document is constantly under review. When I was arrested, by the time I was transferred to a police van, they had moved the handcuffs to the front. I was sat in the secure area at the back of the van with nothing to hold on. I do not remember any police officer seating with me to monitor me during the short trip to the police station. I was involved in an accident whilst in the back of a police van whilst being transported to a police station and I was cuffed as well as not having a seat belt on. It was never explained to me how to deal with an emergency stop under health and safety. I am currently seeking legal advice about the injury that I sustained. The Traffic Operational command does not have or record details of how many detainees are transported to custody suites, although we do keep a record of the number of arrests made, but not for the whole of the Metropolitan Police Area. We will not be able to supply details/numbers of how many detainees were injured while in a police Vehicle. Our Police collision database is not set up to run queries to identify who was injured in a collision. From April 2006 to March 2010, the Met listed eight fatalities following a collision on a road involving a 'police car' (there may be fatalities from collisions involving a police vehicle not included in these figures): four pedestrians, two drivers, one cyclist and one passenger. The passenger was a police officer, all the other fatalities were 'members of public'. It is likely that some detainees were among the several hundred injured annually in collisions involving a police vehicle. If any detainee died due to a traffic accident while they were transported to a police station, their death would likely be classified as a death in police custody rather than a road traffic accident. According to Inquest, this year there has already been 14 deaths following contact with the police. This year's UFFC peaceful vigil and demonstration will hopefully be policed with more consideration. [...] The Home Office said that "commencement orders" would be issued from July to enact some of the measures in the PoF Act. The PoF Act also sets out new laws governing the retention and destruction of DNA and fingerprint profiles of suspected and convicted criminals. Last year the UK's Supreme Court ruled that police guidelines that allowed DNA samples taken during criminal investigations to be retained indefinitely were unlawful because it violated individuals' rights to privacy as guaranteed by human rights laws. DNA and fingerprint samples can be retained "indefinitely" under the PoF Act in select circumstances, including where arrested suspects have been guilty of a serious crime previously. If those arrested suspects have no such previous conviction, their data must be destroyed after a three year period. Police can ask a district judge to issue an order enabling them to retain the information for a further two years, although this request can be appealed against. The PoF Act requires that DNA or fingerprint samples must be destroyed if "it appears to the responsible chief officer of police that" it has been gathered unlawfully or from a third-party person in connection with a suspected criminal's arrest where the arrest was unlawful or based on mistaken identity. However, DNA or fingerprint profile details can be retained beyond the expiry of retention periods for national security purposes unless a Biometrics Commissioner decides that it is "not necessary" for those purposes that the information is retained. The Human Rights Joint Committee had criticised this clause in its scrutiny of the draft PoF proposals. At the beginning of the year, there was an estimated 5,882,724 total number of individuals whose DNA profile was retained on the National DNA Database (NDNAD). Already by 2010-03-31, there was an estimated total of 1,083, 207 innocent individuals whose DNA profile was on the NDNAD. Analysis of the English and Welsh approach so far, of indefinite retention of the DNA samples and profiles of all those arrested, has shown time and time again that retaining the DNA profiles of as many individuals as possible, many innocent, is ineffective and does not increase crime detection rate. The PoFA's section on DNA retention is modelled on the Scottish approach. Once the law comes into force, from July according to Out-Law, six month-old DNA samples retained will be destroyed and most three year-old derived DNA profiles (and fingerprints and palm prints) of those not convicted or convicted of a single minor offence will be deleted as well. This is clearly a welcome step by many whose personal data is on the National DNA Database. 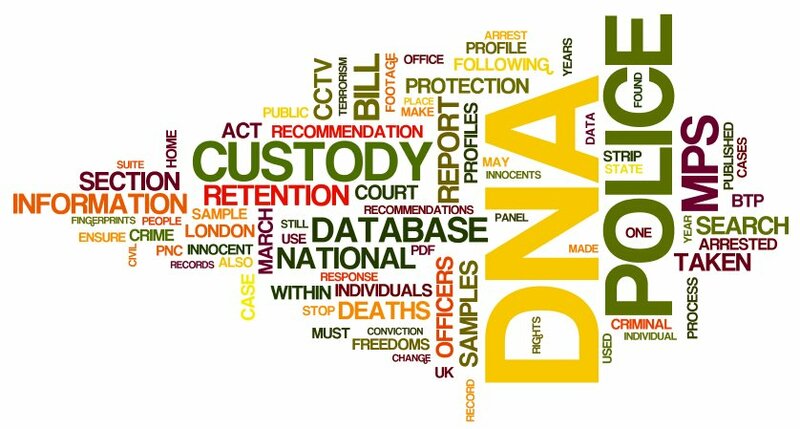 There are plenty of reasons, including stigma, discrimination, visa or job refusal, loss of personal data and higher risk of being falsely linked to crime, to want to be off the National DNA Database, especially for innocents and those convicted for some trivial matter. It is a success for all the privacy activists and victims who campaigned to restore the presumption of innocence and the rehabilitation of offenders having been convicted of a minor crime. GeneWatch UK –as an indefatigable organisation at the forefront of the campaign to change the law to make the National DNA Database much smaller and more carefully controlled, and to safeguard privacy and rights without compromising the use of DNA in fighting crime– deserves much credit in this success. Celebration will happen when the DNA sections come into force and DNA samples are destroyed and DNA profiles, fingerprints and palm prints are deleted. As no deadline has been issued for the enactment of all the DNA sections of the PoFA, if you are an innocent person with a record on the DNA database you may want to contact your MP without further delay. Help is offered at Reclaim Your DNA. 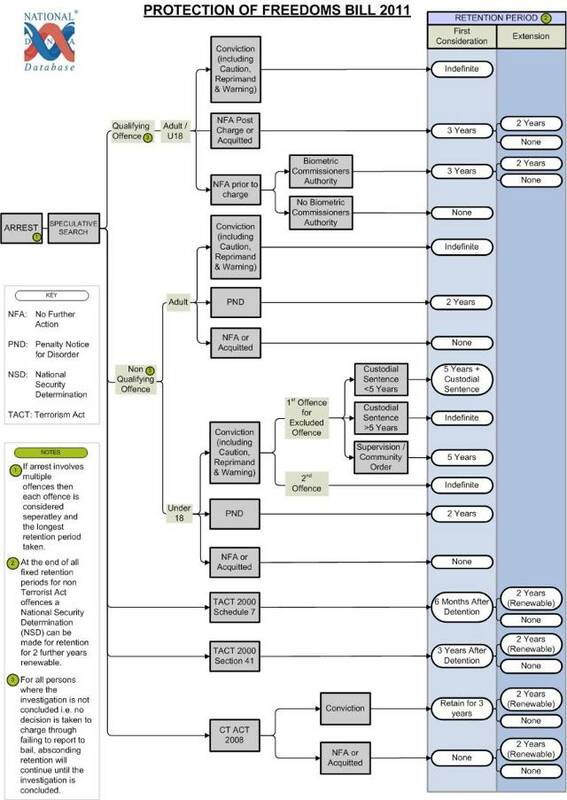 The PoFA has limits, such as the national security exemption criticised by the Human Rights Joint Committee and highlighted in the excerpt from Out-Law.com above, and even removes some of the benefits of the earlier process. In the system that had been in place until now, very few individuals succeeded in getting off the NDNAD, but those that did manage to go through the exceptional case process had not only their DNA sample destroyed and their DNA profile, fingerprints and palm prints deleted, but also their associated Police National Computer (PNC) record deleted. There's no such requirement in the PoFA. And nothing is said either of photographs retained by the police. The retention of photographs has not been reviewed by judges in the court cases about DNA retention so it is likely that once PoFA is enacted, a test case on this specific issue will come to court. When the police arrest someone they usually detain him or her in a cell in a station's custody suite. To ensure detainees are treated well, local community members –known as Independent Custody Visitors (ICVs)– volunteer to conduct unannounced visits of police custody suites and speak with detainees (with their consent) about their experience from the time they arrived in the custody suite. The visits are always done by a pair of ICVs and often last a couple of hours. At the end of each visit, the ICVs discuss with the custody staff any immediate concerns and write notes about the visit and any issues they feel need further answers from the police for follow up at the next quarterly ICV panel meeting. Data obtained from Freedom of Information requests sent to the Metropolitan Police Authority (MPA) and the Metropolitan Police Service (Met) shows that there are 82 custody suites in London with a total of 1,057 cells. The Met explained they have a total of 992 operational cells contained within 72 custody suites across London, however ICVs also visits custody suites of the British Transport Police as well so these are included in the MPA data and my analysis. Over a period of 29 months, they were 4,834 visits by ICVs. During that period, custody suites opened 24/7 were visited on average three times a month, 23 months out of the 29. On average, during a visit there were just over six detainees held in the custody suite and more than three of them where in their cells and accepted to talk to the ICVs. After the United Friends and Family Campaign (UFFC) annual march at the end of last year (see Police provocations at peaceful march against deaths in custody and Question to the police authority about police provocations at peaceful march and Met's response to the 'Protecting the innocent' review on DNA retention), a small group of those that participated in this demonstration went to Marylebone police station to wait for the release of the man who had been arrested at the end of the march and was detained there. This station has an overflow custody suite that is only occasionally used, in particular for public order situations. Several of those present wondered if Marylebone and other overflow custody suites are visited by ICVs. Overflow custody suites are mainly used as charge centres for major public or sporting events such as football matches, for local policing operations, for bail to returns and temporarily while another suite is closed for any reason e.g., cleaning, maintenance, upgrade work. In the couple of days it takes to plan the opening of an overflow custody suites, the police have the duty to inform ICV panels who can then schedule visits to custody suites that are not opened 24/7. Protocol 7 of Appendix G of the London ICV Handbook (pdf) specifies that 'A single point of police contact on the borough should be identified to inform [ICV] panels promptly of any intended changes, closures or additions to custody facilities'. As can be seen in the summary table above, there are 18 overflow custody suites with a total of 159 cells. The average number of months visited during the 29 months surveyed period is low: four. This could indicate either that these overflow custody suites are not open often or that they're not visited even when opened; there's not enough information available to clarify this point. During the visits, there tends to be fewer detainees held in cells with an average of close to three, consequently ICVs on average spoke to fewer detainees in overflow custody suites than in those open 24/7. The spreadsheet from the MPA does not list any ICV visit to Marylebone custody suite for a 29 months period including September and October 2011, and the latest published annual report of the Westminster ICV panel, for 2009, does not mention the Marylebone custody suite at all. The system works for some overflow custody suites as for instance Tooting and Hackney were visited respectively 31 and 15 times during this 29 months period, however, like Marylebone, the Brentford, Orpington and Harrow Road custody suites didn't receive any ICV visit during that period. ICV panels are regularly recruiting new members. The ICV scheme was created following a recommendation of Lord Scarman in his report on the 1981 Brixton riot. It became a statutory scheme with the Police Reform Act 2002 and is managed by Police Authorities. To volunteer, contact the police authority local to where you live or work. In London, the ICV scheme was managed by the Metropolitan Police Authority (MPA) until earlier this month, and now by the new Mayor's Office for Policing and Crime (MOPC). Note that the wealth of information about the ICV scheme has not yet been moved from the MPA website to the MOPC one, so for more details follow the MPA link. Bootnote 2 For even more details, I've collated the source data and my analysis in this Excel spreadsheet. The British Transport Police (BTP) have CCTV cameras in the strip search rooms of all their custody suites in contradiction to their own CCTV in Custody Standard Operating Procedures and to the Home Office guidelines. I detailed these findings in the post British Transport Police pervert CCTV policy. The BTP said that the contradiction with their own procedures does not exist 'as [the BTP CCTV in Custody Standard Operating Procedure (SOP)] is only a draft SOP and is still awaiting sign off'. The latest available draft is dated January 2010. The decision of whether to CCTV record strip searches is taken on a case by case basis. It is a decision that is taken by the individual Custody Sergeant and British Transport Police do not have a specific set of local guidelines that are followed. However, all decisions are carried out in accordance with PACE Code C and with the Safer Detention & Handling Guidelines. I also asked for the relevant training material used to train BTP officers to enable them to determine whether the CCTV recording of a strip search is necessary and proportionate, what elements they must base their decision on, when they must make such decision and what kind of reporting of their decision they must make. The BTP do not hold any such training material. Individual BTP officers are placed in an impossible situation, even if they try to act with respect to the privacy and the dignity of detainees being strip searched: CCTV cameras are installed in strip search rooms in all the BTP custody suites in contradiction to the BTP and the Home Office policies, and BTP Custody Sergeants are asked to decide on an ad hoc basis, without any training or guidelines, whether the actual recording of a strip search will be necessary and proportionate.